Ali Cinar- New York- NYC Mayor has made a statement on so called Armenian Genocide on April 24th. 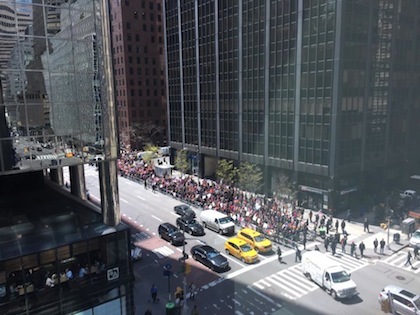 The statement came through late afternoon on April 24th while Armenian Diaspora was protesting in front of the Turkish Consulate located on 50th street. 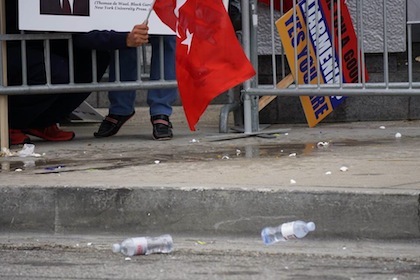 100 Turkish Americans were standing in front of the Turkish Consulate versus 700 Armenian Americans were protesting cross the street. There was big tension during the rally and NYPD officials warned Armenian Groups to follow the rules in order to not provocate the Turkish Groups. One Old Armenian Man crossed the street and stole the Turkish Flag during the rally.Afterwards, one of the Turkish man has chased him to get his Turkish Flag back. Armenian Man has been injured and hospitalized.Turkish man was arrested and released after couple of hours. One of the Turkish American Community Leaders Kurtulus said" Armenians are here for the hatred. We are thankful NYPD for protecting us.We were shocked when our Flag was stolen by Armenian during the protest"
The Turkish consulate had been informed ahead of time that Armenian petition would be presented to the Consul General. The representatives of the two political parties, together with the scouts, delivered the envelope to a representative of the consulate. Meanwhile the protestors, lying down on the boulevard, displayed pictures of our martyrs on their placards, moving spectators. NYC Mayor Blasio stated that " Pope Francis spoke of this in a recent sermon, and it bears repeating on this painful anniversary: There cannot be closure on an atrocity of this magnitude if we do not call it by its name. The bravery of a new generation of Turks ? who are challenging those in their country who deny this tragedy ? is an encouraging step toward long overdue justice and reconciliation." Turkish American Leadership Council has responded to NYC Blasio's statement with the followings: "Political maneuvering could have also entered into your calculation, given that the loud Armenians are the opposite of the taciturn Turks; they wield power disproportionate to their numbers, have more money to toss around, and have strong lobbying organizations such as ANCA, which rates elected representatives on the basis of their support for the Armenians? patriotic obsession; yet we still prefer to be blinded by our idealistic view of you, as having greater character, and backbone. You have hurt Turkish-Americans, and Turks the world over who get wind of your message, very deeply. We hope you will do the right thing and look into these events through sources without axes to grind ? and see that the ?Turkish point of view? is the factual history and nothing that the Turks have made up. Your subsequent choices at that point will not be easy; yet as a person of conscience, it should be your duty to try and undo the harm and hatred your message has caused."